i-Drills are back at it! Following the huge achievement of the FA (Football Association) adopting i-Drills Soccer as their Official Coach’s App, another i-Drills app will be hitting the App Store very soon. 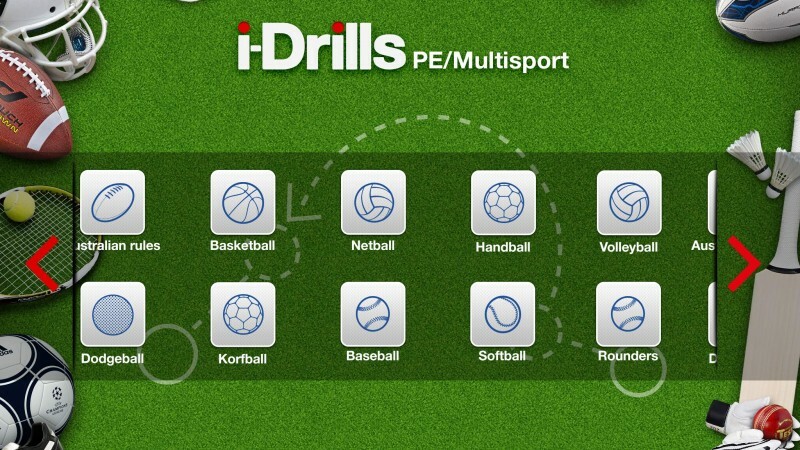 i-Drills PE & MultiSport will be an iPad app primarily aimed at PE teachers and MultiSport coaches. The app gives the ability to create drills for 20 different sports. Some of these sports include: soccer, american football, hockey, basketball, dodgeball and baseball. Each sport will also include specific equipment for that sport (e.g; baseball will include a baseball bat, glove and a baseball) along with standard equipment for drills. A PE teacher might be teaching over five different sports a day to their students; with i-Drills PE & MS, the teacher will be able to create different drills for different sports for each of their lessons – all in one place! This is being developed in the style of the new iOS 7 operating system for Apple (as well as all other i-Drills apps being updates to this new style!) The front screen of PE & MS will be a sport selection scrolling view. When the chosen sport is selected, you will be taken to a whole personal section for that sport – each sport is essentially an app in its own right! Like on the other ever-popular i-Drills apps, there will be a transfer market to download free and in-app purchased predetermined drills/templates to use as your own. i-Drills PE & MultiSport is currently undergoing development and will be with you on the App Store very shortly. We wish Dave Carolan (managing director of i-Drills Apps) the best of luck with his new addition to the i-Drills family and look forward to seeing another one being added in the near future!